For other uses, see Nanchang (disambiguation). Clockwise from top: New Fourth Army Headquarter, Star of Nanchang, Bayi Square, Nanchang sunrise, Pavilion of Prince Teng. 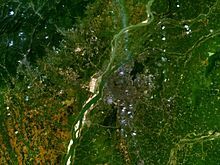 Nanchang (Chinese: 南昌) is the capital of Jiangxi Province in southeastern China. Nanchang is the largest city in Jiangxi Province. Nanchang is located in the central part of Jiangxi Province, with a history of more than 2,200 years. It was called “Yuzhang”in Han Dynasty, “Hongdu” and “Hongcheng” from Tang Dynasty to Song Dynasty. It is located in the hinterland of Yuzhang Plain. According to the Statistical Communique of the National Bureau of Statistics and Statistics of Nanchang City in 2017, as of the end of November 2017, the total population of households in Nanchang City was 5,246,600. The urban population is 2,887,800. Located in the north-central part of the province, it is bounded on the west by the Jiuling Mountains, and on the east by Poyang Lake. Because of its strategic location connecting the prosperous East and South China, it has become a major railway hub in Southern China in recent decades. As the Nanchang Uprising in 1927 is distinctively recognized by the ruling Communist Party as "firing the first gunshot against the evil Nationalists", the current government has therefore named the city since 1949 "the City of Heroes", "the place where the People's Liberation Army was born", and the most widely known "place where the military banner of the People's Liberation Army was first raised". Nanchang is a city of long history. As early as 50,000 years ago, clans inhibited the Anyi region of the Nanchang city. About three thousand years ago, to the north Aixi Lake, south of Qingyun Pu, the arc of the formation of ancient Nanchang gathering area residents. Han Emperor five years (202 BC), Han Guan Ying the local garrison, located Yu Zhang County, next year the construction of the city, site in this city about 4 kilometres (2.5 miles) southeast of Nanchang Railway Station Huang Temple City, the city perimeter miles eighty-four step, called "Guan Ying City", it was built to create a history of Nanchang city. First built "Nanchang County," Yu Zhang county of Gunji, take "grand southern" and "Southern prosperity," meaning, named "Nanchang." 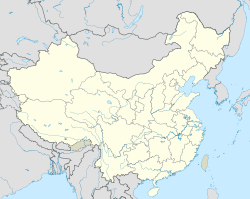 The territories encompassing modern-day Jiangxi Province—including Nanchang—was first incorporated into China during the Qin dynasty, when it was conquered from the Baiyue peoples and organized as Jiujiang Commandery (Chinese: 九江郡). In 201 BC, during the Han dynasty, the city was given the Chinese name Nanchang and became the administrative seat of Yuzhang Commandery (豫章郡), and was governed by Guan Ying, one of Emperor Gaozu of Han's generals. The name Nanchang means "southern flourishing", derived from a motto of developing what is now southern China that is traditionally attributed to Emperor Gaozu himself. In AD 589, during the Sui dynasty, this commandery was changed into a prefecture named Hongzhou (洪州), and after 763 it became the provincial center of Jiangxi, which was then beginning the rapid growth that by the 12th century made it the most populous province in China. In 653 the Tengwang Pavilion was constructed, and in 675 Wang Bo wrote the classic "Tengwang Ge Xu", a poetic introductory masterpiece celebrating the building, making the building, the city, and the author himself known to literate Chinese-speaking population ever since. The Pavilion has been destroyed and rebuilt several times throughout history. Its present form was reconstructed in the 1980s after being destroyed in 1929 during the Chinese Civil War. In 959, under the Southern Tang regime, Nanchang was made superior prefecture and the southern capital. After the conquest by the Song regime in 981 it was reverted to the name Hongzhou. In 1164 it was renamed Longxing prefecture, which name it retained until 1368. At the end of the Yuan (Mongol) period (1279–1368), it became a battleground between Zhu Yuanzhang, the founder of the Ming dynasty (1368–1644), and the rival local warlord, Chen Youliang. At the beginning of the 16th century it was the power base from which Zhu Chenhao, the Prince of Ning, launched a rebellion against the emperor. During the reign of the Wanli Emperor of the Ming dynasty, it housed relatives of the emperor who had been exiled because they were potential claimants of the imperial throne, members of the imperial family constituting about one quarter of the city's population; as a result of this, Matteo Ricci came here when trying to gain entry to Beijing. In the 1850s it suffered considerably as a result of the Taiping Rebellion (1850–64), and its importance as a commercial centre declined as the overland routes to Canton were replaced by coastal steamship services in the latter half of the 19th century. Nanchang has, however, remained the undisputed regional metropolis of Jiangxi. On August 1, 1927, Nanchang was the site of one of a series of insurrections organized by the communists. The Nanchang Uprising, led by pro-communist Kuomintang officers under Russian direction, succeeded in holding the city for only a few days, and provided a core of troops and a method of organization from which the People's Liberation Army (PLA) later developed. In 1939, the Battle of Nanchang, a ferocious battle between the Chinese National Revolutionary Army and the Imperial Japan Army in the Second Sino-Japanese War took place. By 1949 Nanchang was still essentially an old-style administrative and commercial city, with little industry apart from food processing; it had a population of about 275,000. Nanchang first acquired a rail connection in 1915, only connecting to the port city of Jiujiang by the Yangtze. Several other rail links have since been opened. After World War II a line was completed to Linchuan and Gongqi in the Ru River Valley to the south-southeast. 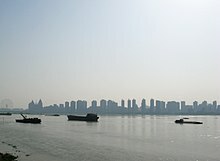 Since 1949 Nanchang has been extensively industrialized. It is now a large-scale producer of cotton textiles and cotton yarn. Paper making is also a major industry, as is food processing (especially rice milling). Heavy industry began to gain prominence in the mid-1950s. A large thermal-power plant was installed and uses coal brought by rail from Fengcheng to the south. A machinery industry also grew up, at first mainly concentrating on the production of agricultural equipment and diesel engines. Nanchang then became a minor centre of the automotive industry in China, producing trucks and tractors and also accessories such as tires. An iron-smelting plant helping to supply local industry was installed in the later 1950s. There is also a large chemical industry, producing agricultural chemicals and insecticides as well as pharmaceuticals. Nanchang is located in inland southeastern China, 130 km (81 mi) south of the Yangtze River and is situated on the right bank of the Gan River just below its confluence with the Jin River and some 40 km (25 mi) southwest of its discharge into Poyang Lake. Nanchang has a monsoon-influenced humid subtropical climate (Köppen Cfa) with four distinct seasons. Winters are short and cool with occasional frosts; it begins somewhat sunny and dry but becomes progressively wetter and more overcast. Spring begins especially gloomy, and from April to June, each month averages more than 218.4 mm (8.6 in). Rainfall peaks in June, averaging 296.3 mm (11.7 in). Summer is long, very hot and humid, with virtually the highest temperatures of any Chinese provincial capital, and with the sun shining close to 60 percent of the time in July and August, making these months the sunniest time of year. The very heavy rainfall from spring to early summer (averaging 914.4 mm (36.0 in) from March to June) fills waterways and saturates soils and vegetation. The combination of high pre-summer rainfall, continuing summer rains, strong sunshine, hot monsoon winds from tropical oceans to the south, Nanchang's inland location (distant from large bodies of water that would cool daytime high temperatures, as at Hong Kong to the south) and the urban heat island effect results in Nanchang experiencing an exceptional combination of sauna-like heat and humidity in July and August. In July, average daytime high temperatures approach 34 °C (93 °F), while average nighttime low temperatures reach 26 °C (79 °F), rendering Nanchang slightly hotter in July (by both day and night) than borderline-tropical Miami, Florida and even tropical cities like Manila, Philippines and Bangkok, Thailand. Nanchang's high summer nighttime low temperatures result from very high levels of humidity, which significantly reduce diurnal temperature variation. Autumn is warm to mild with the lowest rainfall levels of the year. The monthly 24-hour average temperature ranges from 5.5 °C (41.9 °F) in January to 29.5 °C (85.1 °F) in July, while the annual mean is 18.00 °C (64.4 °F). Annual precipitation stands at around 1,610 mm (63 in); with monthly percent possible sunshine ranging from 23 percent in March to 60 percent in August, the city receives 1,832 hours of sunshine annually in average. Extremes since 1951 have ranged from −9.7 °C (15 °F) on 29 December 1991 to 40.6 °C (105 °F) on 23 July 1961. 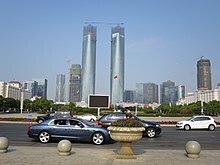 As of 2010[update] (Census), Nanchang has a population of 5,042,565, of which about 2.3 million live in built-up (urbanized) area consists of five urban districts. 37 ethnic groups were counted amongst its prefecture divisions. According to the Statistical Communique of the National Bureau of Statistics and Statistics of Nanchang City in 2017, as of the end of November 2017, the total population of households in Nanchang City was 5,246,600. The urban population is 2,887,800. Honggutan New District (红谷滩新区) is an economic management area and not a formal administrative division. Nanchang is a regional hub for agricultural production in Jiangxi province. The yield of grain was 16.146 million tons in 2000. Products such as rice and oranges are economic staples. The Ford Motor Company has a plant in Nanchang, assembling the Ford Transit van as part of the Jiangling Motor joint venture. Many of its industry revolves around aircraft manufacturing, automobile manufacturing, metallurgy, electro-mechanics, textile, chemical engineering, traditional Chinese medicine, pharmaceuticals and others. Nanchang has a rapid economic development and ranks 15th among the fastest growing 20 cities in the world. It is one of the cities with the most potential for development in China and the world in the future. In 2017, the city’s gross regional product (GDP) was 500.319 billion yuan(80.03 billion USD ), an increase of 9.0% over the previous year. The primary industry’s added value was 19.213 billion yuan, an increase of 4.0%; the secondary industry’s added value was 266.61 billion yuan, an increase of 8.4%; The added value of the three industries was 214.496 billion yuan, an increase of 10.2%. The per capita GDP of 81,598 yuan was converted to 12,285 US dollars according to the average annual exchange rate, and the total fiscal revenue for the year was 78.282 billion yuan, an increase of 14.3% over the previous year. The GDP of Nanchang in 2008 was 166 billion Yuan (24.3 billion USD ). The GDP per capita was 36,105 Yuan (5,285 USD). The total value of imports and exports was 3.4 billion US dollars. The total financial revenue was 23 billion Yuan. Nanchang National Export Expressing Zone is located in Nanchang Hi-Tech Industrial Development Zone, it was approved by the State Council on May 8, 2006, and passed the national acceptance inspection on Sep 7th, 2007. It has a planning area of 1 km2 and now has built 0.31 km2. It enjoys simple and convenient customs clearances, and special preferential policies both for Nanchang National Export Expressing Zone and NCHDZ. Nanchang National High-tech Industrial Development Zone (NCHDZ for short hereafter) is the only national grade high-tech zoned in Jiangxi, it was established in Mar. 1991. The zone covers an area of 231 km2 (89 sq mi), in which 32 km2 (12 sq mi) have been completed. NCHDZ possesses unique nature condition and sound industry foundation of accepting electronics industry. NCHDZ has brought 25 percent industrial added value and 50 percent industrial benefit and tax to Nanchang city by using only 0.4 percent land area. Nanchang has an advantageous geographic location and convenient transportation. It is praised as the “three rivers and five lakes, and the control of the finer and better lakes”. It relies on high-speed railways and aviation hubs to connect three important economic circles (Yangtze River Delta, Pearl River Delta, Inter-provincial traffic corridors in Haixi District). Nanchang is one of the country's comprehensive transportation hubs and one of the most important integrated transportation hubs in Jiangxi. A CRH1 train near Liantang Station in Nanchang. The Nanchang is an important rail hub for southeastern China. The Beijing–Kowloon (Jingjiu) Railway, Shanghai–Kunming railway (formerly Zhejiang–Jiangxi or Zhegan Railway), Xiangtang–Putian railway and Nanchang–Jiujiang intercity railway converge in Nanchang. Nanchang's Bureau of Railways operates much of the railway network in Jiangxi and neighbouring Fujian province. 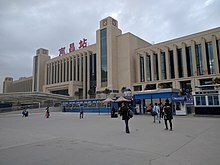 The Nanchang railway station and the Nanchang West railway station are the primary passenger rail stations of the city. Nanchang is connected to Hangzhou, Changsha and Shanghai via CRH (China Railway High-speed) service. Nanchang Changbei International Airport (KHN) built in 1996 is the main international airport. It is situated in Lehua Town, 26 kilometres north of the CDB area. Changbei International Airport is the only one in Jiangxi Province which has an international air route. The airport is connected to major mainland cities such as Shenzhen, Guangzhou, Haikou, Shanghai and Beijing. There is a military/mixed airport near Liantang, Nanchang County. Nanchang Changbei International Airport is the largest airport in Jiangxi Province. In 2014, Nanchang Changbei Airport opened up to 10 international destinations. The airport handled 7.25 million passengers in 2014, an increase of 6.3%. Among them, the Nanchang aviation port exceeded 280,000 passengers, an increase of nearly 40%, becoming the airport's traffic volume. The important force of growth, and will continue to maintain rapid development. On December 6, 2017, the annual passenger throughput of Nanchang Airport exceeded 10 million passengers, making it the nation’s 31st “million-grade airport”. In 2017, passenger throughput reached 10.93 million, a year-on-year increase of 39.0%, a net increase of passenger throughput of 3.07 million passengers; flights took off and 89,000 vehicles, a year-on-year increase of 35.2%; and cargo and mail throughput of 52,000 tons, an increase of 3.3%. In order to cooperate with the construction of the Beijing-Kowloon high-speed railway and Nanchang North Station airport complex transportation hub, large-scale expansion and upgrades are being carried out recently. The road transport infrastructure in Nanchang is extensive. A number of national highways cross through the city. They are the National roads No.105 from Beijing to Zhuhai, No.320 from Shanghai to Kunming, and No.316 from Fuzhou to Lanzhou. The major transport companies that operate in Nanchang are the Chang'an Transport Company Limited, the Nanchang Long-distance Bus Station, and the Xufang Bus Station. National Highway G70 crosses through Nanchang. Nanchang also built its round-city highway G70_01 opening on 2007. The Nanchang Long-distance Bus Station serves long distance routes to Nanjing, Shenzhen, Hefei and other cities outside Jiangxi Province. The Xufang Bus Station operates routes to cities, towns and counties within Jiangxi Province. Nanchang Rail Transit is the first rail transportation system in Jiangxi Province, the world's leading MRT system, the second batch of rail transit cities in China. It will connect Nanchang’s main downtown area and each satellite city, the Nanchang Metro has been in service since 26th Dec 2015. Nanchang is the 25th city in mainland China to put into operation. The planning of Nanchang rail transit project started in 1999 and was officially started in 2009. The first phase of the No. 1 and No. 2 lines was 50,996 kilometers (the first line is the underground line). Line 1 was officially opened and operated at the end of 2015, and Line 2 of the “First Section” began trial operation on August 19, 2017. Nanchang is situated on the Gan River, the Fu River, Elephant Lake, Qingshan Lake, and Aixi Lake. Hence the water routes for Nanchang are critically important for the economy, trade and shipping. Nanchang Port is the biggest port on the Gan River. Passengers can take Nanchang Port and travel by boat to the Jinggang Shan and Tengwang Pavilion. There are passenger ships that also visit Poyang Lake, Stone Bell Hill, Poyang Lake Bird Protection Area, Dagu Hill and other attractions. 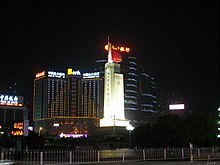 Tengwang Pavilion, a towering pavilion dating to 653,on the east bank of the Gan River and is one of "the Four Great Towers of China"
Qiushui Square, established on 28 January 2004 with the largest music fountain group with music in Asia. Bayi Square and Memorial, at the center of Nanchang, commemorates the founding of the People's Liberation Army during the Nanchang Uprising of 1 August (Ba Yi in Mandarin) in 1927, which led to the formation of the People's Republic of China in 1949. Jiangxi university of traditional chinese medicine Note: Institutions without full-time bachelor programs are not listed. Nanchang is the site of Jiangxi International Women's Tennis Open. ^ Cox, W (2018). Demographia World Urban Areas. 14th Annual Edition (PDF). St. Louis: Demographia. p. 24. ^ "China: Jiāngxī (Prefectures, Cities, Districts and Counties) - Population Statistics, Charts and Map". www.citypopulation.de. Retrieved 29 March 2018. ^ Schwartz, Benjamin, Chinese Communism and the Rise of Mao, Harper & Row (New York: 1951), p. 93. ^ a b c Zhongguo gujin diming dacidian 中国古今地名大词典 ["Dictionary of Chinese Place-names Ancient and Modern"], (Shanghai: Shanghai cishu chubanshe, 2006), p. 2080. ^ Peattie, M., Drea, E. & Ven, H. (2011). The battle for China : essays on the military history of the Sino-Japanese War of 1937-1945. Stanford, Calif: Stanford University Press. ^ 中国气象局 国家气象信息中心 (in Chinese). China Meteorological Administration. Archived from the original on 2013-03-18. Retrieved 2010-05-04. ^ 南昌市2010年第六次全国人口普查主要数据公报. Jiangxi Bureau of Statistics (in Chinese). Nanchang Bureau of Statistics. 20 March 2012. Retrieved 23 July 2015. ^ "Jiangling Motors Corporation, Ltd. website". 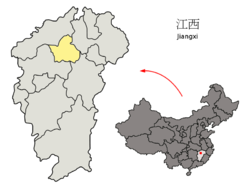 ^ "Jiangxi". Unescap.org. Archived from the original on 2004-06-26. Retrieved 2012-01-16. ^ a b c "NanChang China". English.nc.gov.cn. Retrieved 2012-01-16. ^ "Nanchang Export Processing Zone". RightSite.asia. Retrieved 2012-01-16. ^ "Nanchang High-Tech Industrial Development Zone". RightSite.asia. Retrieved 2012-01-16. ^ "Nanchang Economic & Technological Development Zone". RightSite.asia. Retrieved 2012-01-16. ^ a b "Nanchang Transportation, Get to the City: by Air, Train, Bus, Water". Travelchinaguide.com. Retrieved 2012-01-16. ^ "China claims world's largest Ferris wheel - Boston.com". Archived from the original on May 1, 2007. Wang, Qiaolin (Chinese: 王巧林; pinyin: Wáng Qiǎolín) et al. 1996. Jiangnan Famous Site: The Pavilion of Prince Teng (simplified Chinese: 江南名胜 滕王阁; traditional Chinese: 江南名勝 滕王閣; pinyin: Jiāngnán Míngshèng Téngwáng Gé). Baihuazhou Literary Press (Chinese: 百花洲文艺出版社; pinyin: Báihuāzhōu Wényì Chūbǎnshè). 247 pages. ISBN 7-80579-797-8. Wikivoyage has a travel guide for Nanchang. Wikimedia Commons has media related to Nanchang. This page was last edited on 3 April 2019, at 22:50 (UTC).